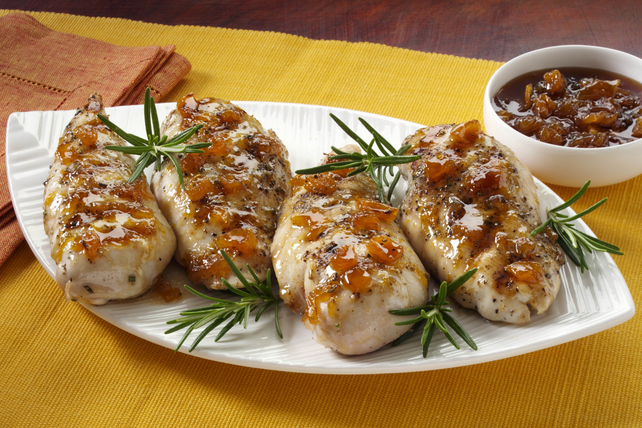 The secret to these flavourful chicken breasts is the simple marinade, made easily with KRAFT Dressing, fresh rosemary and a splash of Worcestershire sauce. Mix Worcestershire sauce, rosemary, pepper and 1/4 cup dressing until blended; pour over chicken in shallow dish. Turn to evenly coat both sides of each breast with Worcestershire sauce mixture. Refrigerate 30 min. to marinate. Remove chicken from marinade; discard marinade. Heat remaining dressing in large nonstick skillet on medium heat. Add chicken; cook 3 to 5 min. on each side or until breasts are evenly browned on both sides. Cover; cook 15 min. Meanwhile, mix jam and wine until blended. Spoon jam mixture over chicken; cook, uncovered, 5 min. or until chicken is done (165ºF). Garnish with additional rosemary sprigs before serving. Substitute chicken broth or water for the wine.